OCTA in cooperation with the California Department of Transportation (Caltrans) is widening the San Diego Freeway (I-405) between State Route 73 (SR-73) and Interstate 605 (I-605). 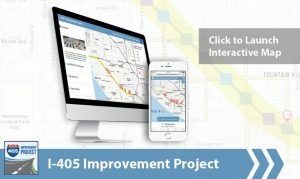 The I-405 Improvement Project will improve 16 miles of I-405 between the SR-73 freeway in Costa Mesa and I-605 near the L.A. County line. The project includes adding one regular lane in each direction between Euclid Street and I-605 and making improvements to freeway entrances, exits and bridges. In addition, the project will add the 405 Express Lanes, incorporating the existing carpool lanes and a new lane in each direction between SR-73 and I-605. The 405 Express Lanes will give solo drivers the choice to speed up their commute for a toll and give options for carpoolers to use the lanes for free. When the express lanes open, two-person carpools will pay a toll only during peak hours and carpools of three or more will be free at all times. Construction is anticipated to start in early 2018 and scheduled to be complete, along with the opening of the 405 Express Lanes, in 2023. Check out our fully interactive, mobile-friendly map! Users can click on a location to see when construction is anticipated to start and find details on any current pre-construction activities planned in the area. The newly launched map currently features preliminary construction activities that are happening now. When construction officially starts, users can explore the project area in real time, view both planned improvements and current construction activities for each bridge, as well as, updated closure and detour information. We encourage you to sign-up to receive project updates via email, text or automated call. Project updates include information on closures and detours, as well as significant project milestones. To sign-up now, please click HERE. The ABAOC, a 501(c)(6) private non-profit organization established in 1992, is one of California's most active Asian business associations on the basis of active membership and overall outreach to its member business owners. The ABAOC is the organization that truly represents over 100,000 Asian businesses in Orange County, California.